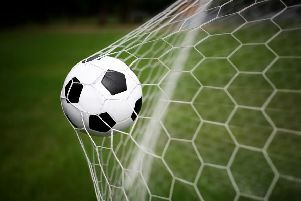 For the second successive game, Bexhill United’s footballers saw a two-goal lead turn into defeat on Saturday. The Pirates led 3-1 before going down 4-3 in a pulsating match away to a Steyning Town side which seemed to be running its goal of the season competition in a single afternoon. Bexhill’s players went out with the message to enjoy their football and they really seemed to take that on board. Wide midfielder Nathan Lopez was described by Light as ‘phenomenal’, so disciplined in protecting the full-back behind him, yet so skilful going forward. Light was happy with how things went during the early stages until Steyning took the lead with a goal out of nowhere. Chad Milner played a one-two and made his way across the pitch before firing into the top corner from 20 yards. If anything, though, Bexhill upped their game from that point. Ashley Kidman, playing up-front following the late withdrawal of Drew Greenall due to illness, muscled his way to the byeline and despite a suspicion of pulling an opponent back, pulled the ball back for Lopez to equalise. Bexhill went in front with an exquisite goal soon afterwards. Gordon Cuddington netted his 15th of the season and sixth in the last four games with a great header - into the only part of the goal the goalkeeper wasn’t covering - from a lovely ball by Kenny Butchers. The visitors then went 3-1 up. Steyning’s centre-half slipped which allowed Kidman through on goal and he took every last second available to him before rolling the ball under the goalkeeper. Bexhill had another chance when Connor Robertson opted to bring the ball down rather than head for goal and Steyning cleared following a bit of a scramble. Steyning swiftly pulled one back as Charlie Romain cut in from the right and unleashed a stunning shot which crashed against the underside of the crossbar and inside of the post, just crossing the line. The second half was a bit more cagey. Steyning came out brightly, as Bexhill expected, and having got on top, equalised with the only goal Light was really disappointed about. Following a well-worked short corner, the ball was passed into the box and a Steyning player dummied it for Ollie Hartley to score as Bexhill were a bit slow to react. Although Bexhill kept the ball nicely, Steyning were in the driving seat without really getting in behind Bexhill. The hosts won it with a stunning strike from Ben Greer from almost as far out as the centre circle which swerved and flew into the roof of the net. Bexhill: Holland; Butchers, Robertson, McFarlane, Ottley; Lopez (Barden), Holden, Giles, Giles, Cuddington, Wheeler; Kidman (Kane).